Southampton City Art Gallery holds a painting bequeathed to them in 1963 from a private collection, listed as a work by an unknown artist without any supporting information. It was suggested that the artist could be in the circle of Edward Pritchett (1828–1879). Clive Hamilton found the composition a pleasing one, which bore a strong influence of Edward Pritchett, especially the subject matter, palette, figures and buildings. He supported the initial suggestion of Pritchett as the artist but expected a signature for confirmation. He also suggested other candidates for the artist: Arthur Joseph Meadows (1843–1907), William Meadows (active 1870–1895), and William Wyld (1806–1889). Pieter van der Merwe described similar views of the Piazza looking towards Santa Maria della Salute seen on the internet and felt that an attribution to Pritchett would be a reasonable one. Andrew Greg agreed it to be a Pritchett type. Clive Hamilton concurred and mentioned some other artists whose work inspired Pritchett: Richard Parkes Bonington (1802–1828) and James Holland (1799–1870). The absence of Pritchett’s signature puzzled him. Richard Green recognised the view as being from the Molo, the waterfront area between the Piazza di San Marco, and the Bacino di San Marco. He suggested an alternative title, ‘Venice: A View from the Molo Looking towards Santa Maria della Salute and the Dogana’, or ‘Looking Across the Entrance to the Grand Canal to the Dogana and Santa Maria della Salute’; all were views favoured by Pritchett. Richard agreed that the evidence was sufficient, and recommended: ‘attributed to Edward Pritchett’ as the artist listing. Richard Green briefly mentioned Arthur Tildern Jeffress (1905–1961), who bequeathed his collection to Southampton City Art Gallery, and whose collection this painting came from. 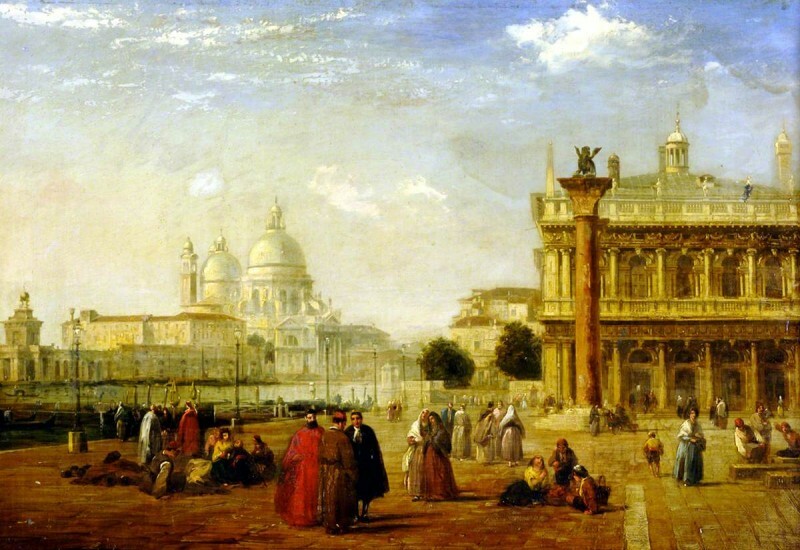 Richard commented that this provenance was interesting in relation to the painting’s subject, as Jeffress loved Venice and had property there. Consequently, the artist of the work was likely to be of some stature. Pieter thanked Richard and asked the collection to express a view of the ‘attributed to’ suggestion. Andrew Greg agreed with the consensus and recommended changing the title to ‘Venice: A View from the Molo Looking toward Santa Maria della Salute and the Dogana’. The Art UK record was updated. Could this be by an artist in the circle of Edward Pritchett?